It’s been a week since I asked our readers to help me pick a comic to read in order to appease Cyclops. It was a tight race but I have the official result, the winner is (drumroll please……………………………….) 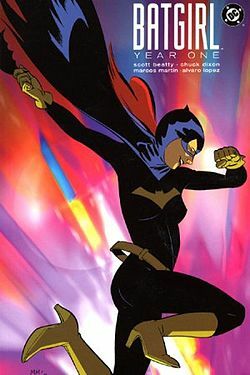 Batgirl: Year One! I know that as Cyclops is reading this he is squealing like a little girl because that’s the one he wanted to win (he promises he only voted like a dozen times). As a quick reminder here were my initial thoughts of Batgirl: Year One. There you have it, stay tuned for a review of Batgirl: Year One as soon as I can get through it. Follow us on Twitter to get quick thoughts on the story as I get into the story. Thanks for voting….this comic better be good or I blame all of you.